Get 5 PS3 Move Accessories for $4.99! + Eligible for FREE Shipping! If you have a PS3 Move, you're going to love this deal! Hurry over to Amazon to score 5 essential PS3 Move Accessories for only $4.99! These ship for FREE if you have Prime or make a $25 order. 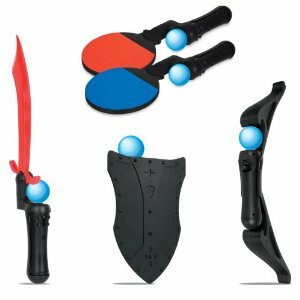 (click here for a 30-day free trial of Prime) Accessories include 2 Table Tennis extensions, Archery Bow, Sword extension, Shield and 2 Remote Cradles. This deal makes each accessory only $1 each and I don't think it can get any better than that!